Gargnano is a rather big down made out 13 hamlets spread between the western coast of lake Garda and the hilly hinterland. It is placed in the Alto Garda Bresciano park. Documents left by the roman historian Tito Livio and the finding of a few ancient tombstones are proof that Etruscan people, Celts, and Romans have succeded each other in the territory of Gargnano. The name of the town is descended by the name Garnier according to a document dating back 937. During the middle ages the territory of Gargnano was under the domain of the Visconti family. Later on it became one of the 42 communes of the Magnifica Patria (Wonderful Motherland), under which it became part of the Republic of Venice. Subsequently Gargnano was annexed by the Brescian Republic, becoming thus part of the napoleonic dominion. In modern ages the fate of the town is strictly related to that of the Feltrinelli family, who constructed several buildings, such as a few schools and a hospital. The family's two villas were also the venue of Mussolini's government during the Republic of Salò and they are one of the main places of interest of the town. Gargnano is known for having one of the most beautiful Old town centers in lake Garda. In this beautiful landscape rich in art and history you can discover historical villas, beautiful churches, wonderful gardens and lemon farms. Villa Feltrinelli, also known as the Duce's Villa or Villa Bettoni, also deserves a visit in its beautiful gardens. The town also offers tourists the chance to visit the gothic cloister of the ex convent of Saint Francis, founded in 1221. In the highest part of the town is the Church of Saint Martin of Vantini, a neoclassic church with a very important handpainted oil canvas depicting the Virgin Mary and Baby Jesus. Up north is the romanic church of Saint Giacomo in Calì, considered to be the oldest church in Gargnano, home to beautiful frescos of the 14th century. There are many buildings around Gargnano's dock, some of which still have traces of cannon bombardments dating back 1866 during the third war for independence. The buildings in the center of Gargnano focused on the lake still have evidence of the romance of antique fisherman villages, while the side hamlets on the hill still have many antique stone houses with very thin alleys. Aside from being the biggest town of the Alto Garda Bresciano Park, Gargnano is the capital of the Gardesan Sail, so water sports and nature fans pour into this town every summer. Every September the International Centomiglia (hundred-mile) regatta starts from the hamlet of Bogliaco, a famous and spectacular sailboat race a hundred miles long. Every year the regatta attracts thousands of spectators and is considered to be the most important regatta on italian lakes. In the summer months of July, August, and September the town organises many guided tours to visit Gargnano and its surroundings, while during the rest of the year it hosts other events, such as the Gargnano jazz concerts and the historical vehicle race known as the Millemiglia (Thousand-miles). Gargnano can also be the starting base to discover many of the events surrounding it when Autumn starts. In mid-october there is the spectacular Limone Skyrunning Extreme event in the town of Limone, a weekend dedicated to trail running a 29km long path along the Alto Garda mountains, with a difference in level of 2540 meters. An event you can't miss in the town of Tignale is the Truffle festival, celebrated between the end of September and the beginning of October, which allows people to participate in “truffle hunting” and the tasting of the precious mushroom as well as other local biological products. Around the same period is the festival of Grapes and Bardolino wine, which is appreciated by German tourists to the point of being nicknames “Trauben kurz”. The Lombard coast of Lake Garda, unlike the Venetian coast, has many 5 star accomodation facilities, one of which is the famous “superior” and award-winning world-level Lefay Resort, in Gargnano. The structure, already famous and consolidated, is working intensly with new clientele from arab countries, such as Dubai and Abu Dhabi, where the excellent and quality products of our Lake are highly appreciated. New connections involving the Russian air company S7 for clientele from Moscow and Saint Petersburg are imminent. Another beautiful and famous location that we find in Gargnano is the famous Villa Feltrinelli, it's built in 1892 and completely restored in 1995. Today this Resort is located in a centuries-old park and is frequent destination for VIP looking for absolute privacy and relaxation. It also houses an extremely high level kitchen managed by top-notch Italian masterchefs! 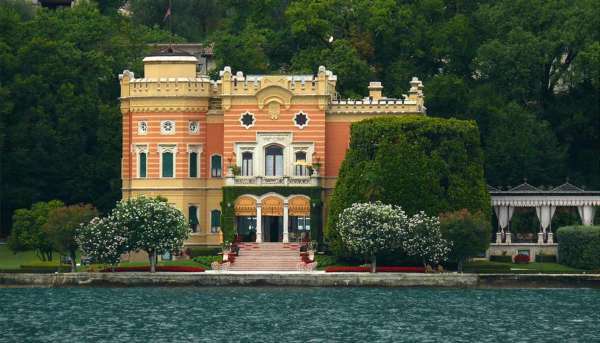 Currently this structure is certainly among the most famous, elegant and sumptuous of the entire area of Lake Garda. Near Gargnano is the town of Toscolano Maderno and its Paper Mill Valley, once an ancient industrial center for paper production. Here we can find the Paper Museum which allows visitors to discover how paper was made in this area a very long time ago. The main hamlets in Gargnano are Villa and Bogliaco, both lake-front villages. The communal territory is spread towards the hinterland hills and includes lake Valvestino, an authentic fjord nestled in the mountains, which is why Gargnano is also known as “the town between to lakes”. The landscape is thus very varied and offers its visitors the lake, the plain, the hills, and the mountains, not to mention the famous lemon farms that allows one to breathe a mediterranean air in the town. A recent and must-see attraction of the town is the suspended bike path that was opened in July 2018 and has already been defined by many bikers as one of the most breath-taking and spectacular bike paths in Europe. It is 2.5km long and the neighbouring towns are working to extend it to 12km towards Limone del Garda and Riva del Garda. To discover Gargnano's essence, there is no better place than the lemon farms. They are build on tall stone pillairs placed in rows and closed on three sides with stone walls. These farms offer us a direct testimony of the agricultural past of the area. The lemon farms were built along the coast of the lake several centuries ago to allow lemon farming in this latitude. The lemon economy flourished and reached its peak towards the mid 19th century. In fact, in 1840 the Lake Garda Society was founded in Gargnano, and it was the first italian agricultural cooperative entirely dedicated to the lemon trade. Nowadays tourists can still visit some of the lemon farms managed in the traditional local way, and see century-old lemon trees of the Madenina, Limone Lunario, or rare Salò cedar varieties. Other important local products are the extravirgin olive oil, capers, and fresh water lake fish.